Design by Luc Ramael, 2005. Table lamp for diffused or downward lighting. 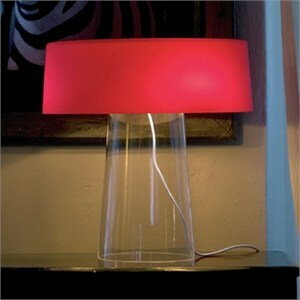 Blown glass diffuser and base available in several color combinations. Matte white painted metal lampholder structure. White polyester-covered feeding wire with in-line dimmer. Includes 82.6" cord. Dimensions 18.8"D X 18.8"H. Uses 3 X 60W 120V G9 halogen lamps (included).